The main part of this project was a survey of all prehistoric funerary and ritual monuments to assess their value, condition and vulnerability and to improve their description and understanding. In Gwynedd this survey was carried out in 2000-2003. In the following year a trial synthesis was carried out of data from the four WATs to confirm their compatibility with a view to a final publication for the whole of the project in Wales. In addition some topographic survey was carried out at a specific focus of funerary monuments at Waun Llanfair, Llanfairfechan, Conwy, to provide background evidence to support palaeo-environmental work carried out there as part of the project. After the field survey in Gwynedd, Anglesey and west Conwy was completed in 2003, detailed reports were produced for Cadw as well as three summary published reports in local journals of historical societies in Meirionnydd, Caernarvonshire and Anglesey. In 2006-7 some follow-up work was agreed and carried out. This comprised further environmental sampling work at the Waun Llanfair funerary monument complex, near Penmaenmawr, some interpretative and publicity work and geophysical survey of a few selected monuments with specific potential. This project derived from the Cadw Pan-Wales Prehistoric funerary and Ritual Monument Survey and was designed as a palaeo-environmental study of one area of funerary monuments. 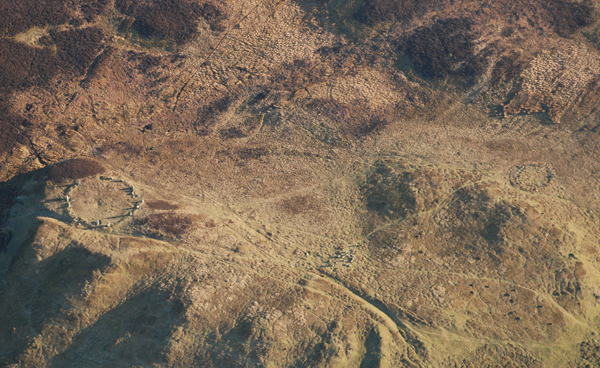 The area chosen was an area of upland above Llanfairfechan and Penmaenmawr, Conwy, where there is an unusually large concentration of prehistoric funerary and ritual monuments. These include a major stone circle, The Druids’ Circle, two large ring cairns and numerous smaller cairns of various sizes and designs. Not far to the north of these is the Neolithic stone axe factory of Graig Lwyd to which this concentration of monuments may have some connection. In 2004 three peat columns were taken by Astrid Caseldine from deposits in and around the Waun Llanfair basin. Preliminary assessment (AW 2004) shows that the columns cover a long chronological range, but full study is yet to be carried out. The programme in 2006-7 comprised sampling of buried soils from a variety of monuments for possible pollen analysis, radiocarbon dating and contextual study. This aimed to provide a chronological picture of activity in the area and allow an understanding of the use of this rather remote area of upland. The monuments chosen were two burnt mounds, two wandering walls and three cairns. Two of the cairns were simple stone mounds belonging to a scatter of such mounds around the basin. One of the cairns was a large kerb cairn with a (robbed) central cist, a scheduled ancient monument (PRN 470, SAM C349) and consent for the work was sought from Cadw. The main programme of work was carried out in April 2006 led by George Smith and John Griffith Roberts with the help of local volunteers and second year archaeology undergraduates from Bangor University. The work on one cairn was during June and the excavation of the kerbed cairn was carried out in November. After recording of the trenches and planning of each site the trenches were backfilled and turf replaced. The work on the cairns was designed to avoid any central areas where burials or other deposits might be found. Column and individual small and bulk context samples were taken of buried soils, where suitable. Charcoal for radiocarbon dating was collected from the burnt mounds and from the kerbed cairn but none was found in either of the two simple cairns or the walls. Hazel charcoal from one burnt mound was sent for radiocarbon dating and produced a date of 3230±40 BP (Beta-224978). There were no buried soils beneath the walls but one was covered by basin peat and a general period may be assignable from the context in relation to the palaeo-environmental data from the column. Circumstantial evidence suggests that the walls may belong with medieval or early post-medieval pasturing rather than with the prehistoric monuments nearby. Preliminary study of the buried soil samples indicates that they do contain some pollen and further radiocarbon dates will also be obtained. One of the simple cairns produced no dating evidence but the other covered a scatter of material of Late Neolithic date. This comprised worked flint, which included three flint scrapers, a knife and an oblique arrowhead and a scatter of worked Graig Lwyd stone, which included a narrow stone axe or chisel. It seems most likely that the cairn and the flint and stone tools are associated and this was a surprise as it had been surmised that these small cairns were of later second millennium date and associated with the nearby burnt mounds. The kerbed cairn, a typical Early Bronze Age monument, was also found to overlie a scatter of worked flint and Graig Lwyd stone although in this case the material lay in the soil buried beneath the cairn and its kerb and so seemed likely to belong to a general scatter that pre-dated the cairn, rather than being associated with its construction. These finds provoke new questions about activity in the area, suggesting the presence of some wider activity contemporary with the Graig Lwyd Neolithic axe factory, and possibly some association between Graig Lwyd and later funerary and settlement activity in the area. These questions may be better formulated when the palaeo-environmental studies are completed in the coming year.